Most of the tips and best practices for reconstructing density using DENSS can be found throughout the Tutorial pages. Here I will just describe a few handy tips that aren’t mentioned elsewhere. The primary result from a single reconstruction of denss.py is the output.mrc file. This file contains the final electron density reconstructed by DENSS formatted as a CCP4/MRC file which is one of the most common volumetric data formats used. It can be opened by most volume visualization programs such as Chimera, PyMOL, EMAN2, and many others. After running the averaging procedure with denss.all.py or superdenss, the final averaged density can be found in the folder containing all of the output with the output prefix you specified with the -o option, named something like 6lyz_avg.mrc. Additionally, if you have the matplotlib module installed, a file called something like 6lyz_fsc.png will be created showing a plot of the Fourier Shell Correlation calculated from the averaging procedure with the estimated resolution given. The resolution is also printed to the terminal screen at the end of the averaging procedure. where the #0 refers to the object ID (check the Tools > General Controls > Model Panel), and here the 17000 is the volume you want to enclose. This will load your map and create a volume object from it. By default it will color the density as 2Fo – Fc, which in most cases will essentially give you an envelope of the particle. To see the internal density fluctuations we need to create a new color “ramp”. This can be done in one of two ways. First, to color your density interactively, use the volume adjustments dialog by selecting the “C” (Coloring) box next to the object name, and select “panel”. In the new window that pops up, adjust the opacity of the dots by dragging them up or down or adjust the electron density value by dragging them right or left. This will create a new color ramp called “colored_density” that gradually changes color and opacity from transparent blue at the lowest densities through cyan, green, yellow and finally red at the highest densities. By default these values are given in units of standard electron density sigma from crystallography (rather than absolute e-/Å3). Note that DENSS reconstructions often have significant density at very high sigma values (much higher than crystallography) due to the fact that the box size is much larger than a typical crystallographic unit cell and the solvent region is filled with zeros. If you would like to make the new colored_density color ramp to be available every time you open PyMOL, add the volume_ramp_new line above to your .pymolrc file (likely in your $HOME directory, or create it if it doesn’t exist). Now you will be able to select the color ramp from the “C” box dropdown menu. To adjust the values for viewing the density, open up the volume adjustments panel in PyMOL by selecting the “C” (Coloring) box next to the object name, and select “panel”. In the new window that pops up, adjust the opacity of the dots by dragging them up or down or adjust the electron density value by dragging them right or left. One of the first things to determine is whether the settings you have set for the individual runs of denss.py were sufficient for accurately reconstructing the particle. While the default values are suitable for most standard cases, for more complex cases, such as particles with multiple connected domains, or molecules with large aspect ratios (e.g. > 5:1), it is not uncommon for the fit of the scattering profile to be poor relative to the experimental data. This can be evaluated by viewing the output_fit.png file which contains a plot of the intensity versus q values for the q-shells used in the reconstruction. Note that after the last iteration of DENSS, the structure factors are scaled one final time to ensure that the intensities match exactly that from the input data. However, just prior to the final scaling of the structure factors, after the real space restraints are imposed for the last time, the fit of the calculated intensities versus the experimental intensities is calculated and recorded, and ultimately plotted in the output_fit.png file. This is to give an indication of the quality of the reconstruction, as by the end, after the process has converged, this plot should closely fit the experimental data. 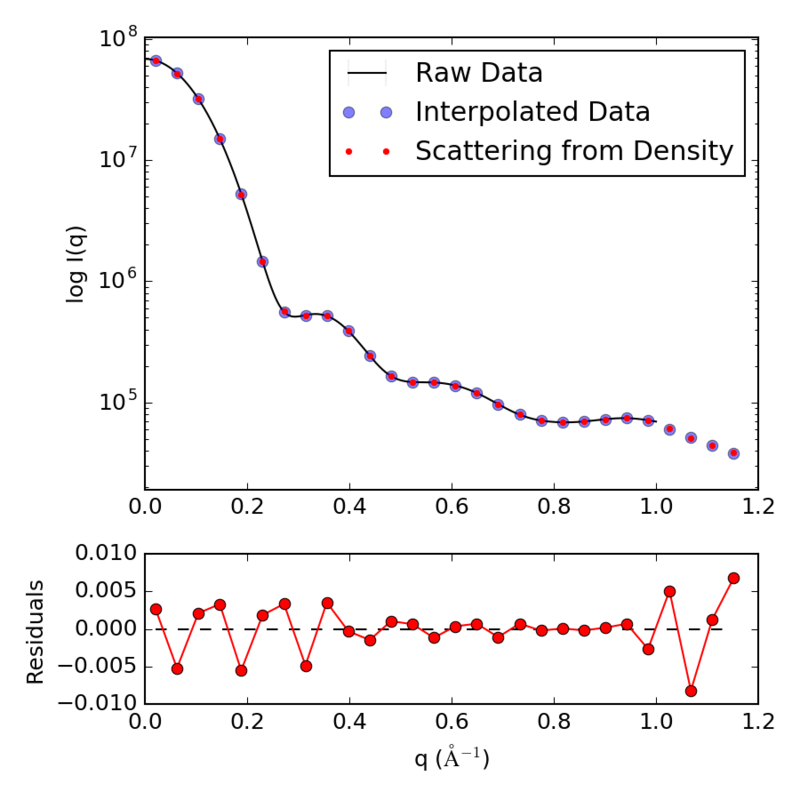 Plot of the fit of the calculated intensity from the electron density reconstruction using DENSS compared to the experimental scattering data. The above example shows a good fit between the two curves, suggesting that the reconstruction was successful. In some cases, e.g. complex shapes, the fit shown in this plot may be poor. If that is the case, try increasing the oversampling ratio (-os option) to 5. Three additional plots saved in .png files (and the _stats_by_step.dat file) show how the χ2, Rg and Support Volume changed as the reconstruction progressed. Note that before the step when –enforce_connectivity removes extra regions of density in the solvent, these numbers are particularly inaccurate. The three plots for 6lyz.out using default parameters are shown below. The decay and ultimate plateau of χ2 indicates that the reconstruction has converged and additional steps will have little effect on the results. Oftentimes you will want to compare the final electron density map with some known structure (or partially known structure), such as from crystallography. There are a few ways this can be done. The built-in script denss.align.py can align the 6lyz_avg.mrc reconstruction to atomic coordinates 6lyz.pdb. This script will first calculate an electron density map from the pdb file (at a default resolution of 15 Å, after recentering the pdb), and then align the 6lyz_avg.mrc to the calculated map. One advantage of using this script is that enantiomer generation and selection is built in. While denss.all.py and the -e option of superdenss can generate and select the enantiomers that are most similar between multiple reconstructions from denss, there’s no guarantee that the selected enantiomer in the final average is actually the correct enantiomer, just that all the reconstructions represent a similar enantiomer for the purposes of averaging. Hence, if you would like to compare your final averaged density to a known structural model, its possible that denss may have selected the wrong enantiomer, making comparison with your structure difficult. This script will save three new files: 6lyz_avg_aligned.mrc (the aligned map); 6lyz_centered.pdb (the recentered pdb file); 6lyz_pdb.mrc (the map calculated from the recentered pdb file). You can then open these files in Chimera or PyMOL and see how they align. This will save a 6lyz_avg_aligned_fsc.dat file with the FSC curve and a 6lyz_avg_aligned_fsc.png file with the plot. It will also print the estimated resolution to the screen. Then rotate (left mouse button) until you get a rough alignment of the pdb model to the volume. Then to perform a finer alignment, open up the Fit in Map tool (Tools > Volume Data > Fit in Map). Select the pdb model from the “Fit” drop down menu (probably will start with “select atoms” in drop down menu) and your 6lyz_avg.mrc volume file in the “in map” drop down menu (which will probably already be filled in for you). Then click the “Fit” button a few times to perform a more accurate fit. To save the aligned pdb file, go to File > Save PDB… in Chimera. Now we need to save that resampled map as an MRC file. Go to the Volume Viewer window and select File > Save map as… (make sure you have selected the new resampled map object in the Volume Viewer, in my case its now ID #2). This will create a new .mrc file that we can use to calculate the FSC curve (be sure to save it in the same directory as where your 6lyz_avg.mrc file is for the next step). which will create a new file called 6lyz_pdb2map_fsc.txt containing our FSC curve comparing the averaged DENSS reconstruction and the aligned and resampled 6LYZ pdb model. While denss.all.py and the -e option of superdenss can generate and select the enantiomers that are most similar between multiple reconstructions from denss, there’s no guarantee that the selected enantiomer in the final average is actually the correct enantiomer, just that all the reconstructions represent a similar enantiomer for the purposes of averaging. Hence, if you would like to compare your final averaged density to a known structural model, its possible that denss may have selected the wrong enantiomer, making comparison with your structure difficult. To generate and select the best enantiomer, use the procedure described in the denss.align.py script above.